You are buying the Kendall Dermacea Non-Sterile 12-Ply Dressing 4x4 200/bx Case of 4, Model # 441215. ADW Diabetes offers a complete line of wound care products by Kendall. We offer these items in single boxes as well as case packs for your convenience. Save on all your Kendall wound care product with ADW Diabetes. 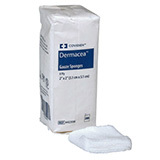 Kendall Dermacea Non-Sterile 12-Ply Sponge Dressing 4x4 200/bx case of 4, Model # 441215 offers clinicians and home care a cost effective alternative for 100% cotton gauze dressings. This economy line of medical grade gauze sponges provide for wound dressings, debriding, wound packing and wound cleaning.